1. When was Ronald Reagan born? 2. What was the complete name of Ronald Reagan? 3. Ronald Reagan was the ____ President of US? 4. Who among the following was the Ronald Reagan's Vice President during his presidency term? 5. What was Reagan Ronald's FBI code name during the Red Scare of the 1950s? 6. Before Ronald Reagan joined politics, he was a _____? 7. In 1946, Ronal Reagan became president of what entertainment industry group?
" 8. 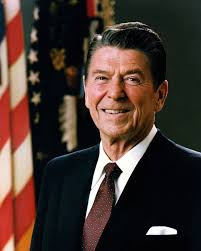 Before Ronald Reagan became President of USA, he was the 33rd Governor of ________? 9. From which college did Ronald Reagan graduated in 1932? 10. When did Ronald Reagan died?